Ptarmigan Cirque is located above Highwood Pass on the highest paved road in Canada. This gem of a hike in Kananaskis provides quick access into the alpine with only 200m of height gain. Even toddlers and preschoolers should be able to complete the short 4.5 km loop and you'd be hard pressed to find an easier way to reach the high country of the Rockies. I'm still trying to figure out exactly how many families we had out for the hike two weeks ago but I'm estimating it was around 15. We lead our small army of children up to the Cirque and I'm pretty sure it was the most preschoolers the trail has ever seen at one time. There were kids walking, others riding on parents' shoulders, and more in child carriers. Somehow though they all made it up to the top and most went further to a pretty little waterfall where we met to have lunch. We met at the Highwood Meadows Day Use Area on Hwy 40 in Kananaskis. From there we followed a short interpretive trail before crossing the highway and ascending the steep switch backed trail to the Cirque. If you find yourself out of breath on this section, take frequent rest breaks and carry on because the trail flattens out once you reach the cirque. It's absolutely worth it to do whatever you have to, to get the kids (and yourself) up the first challenging part. At the top you'll find yourself in a meadow that looks like something straight out of a scene from the Sound of Music. You just may find yourself wanting to dance across the meadow singing. The pace and mood picked up once we reached the top of the switch backs, and we made our way around the loop trail through the alpine cirque. The trail is well signed so you don't have to worry about getting lost. Alberta Parks is also very diligent about placing bear warnings on the trail when there have been sightings in the area. In fact, the trail is often closed in summer to protect hikers from encountering bears. Regardless of warnings (or lack there of), it's always a good idea to carry bear spray and travel in a tight group while hiking this trail. Now this is where the fun begins with scrambling and tons of rocks to play on! At the back of the cirque, we left the loop trail and headed for a lovely little waterfall that we wanted to show the kids. In all honesty, I think they found the climbing wall to be more interesting! Love this little climbing princess! 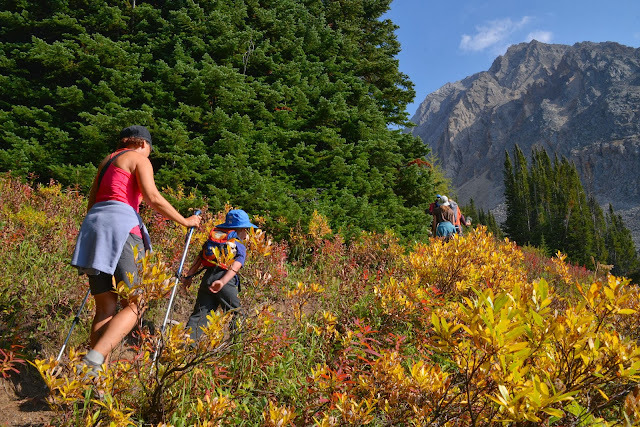 Ptarmigan Cirque is a good half day hike with kids but can definitely be extended into a full day outing depending on how much time your children want to spend scrambling boulders, exploring the cirque, picking berries, and running around. Allow for plenty of time and bring lots of snacks. What a beautiful trail! And yes, kids of all ages love climbing on rocks. Love to hear about great hikes in other parts - someday I want to come back to Canada and do more exploring. Thanks Linda. I hope you can come back soon. Thanks. Maybe we'll see you this weekend. Thanks. Wish you could join us this weekend. Looks amazing, I am adding this to our must do list for next year! Maybe we'll have to plan a camping/hiking trip there next summer!